I’ve been away on vacation but prior to my departure last week, I was very busy exploring a technique which is new to me in weaving and dyeing. Undoubtedly, many of you have heard of woven shibori, a Japanese dyeing technique that Catherine Ellis so brilliantly adapted for the loom. During the painted warps workshop, Kathie Roig mentioned that I might want to think about trying shibori using paints or dyes. I began to get a vision in my head for a worship stole for my brother who is a Lutheran pastor. An upcoming dye day at the Cleveland West Weavers gave me the opportunity to plan for a sample to explore the possibilities. 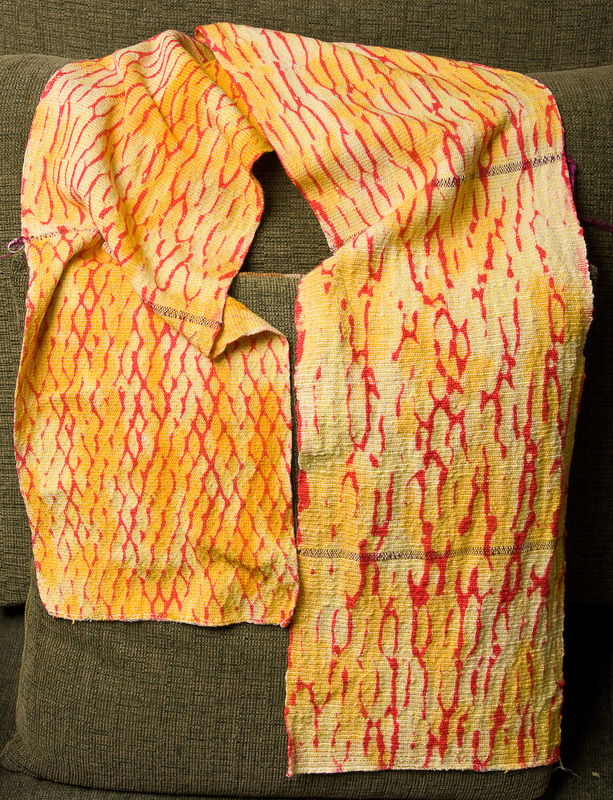 First I warped up the loom with a combination of rayon and cotton with the idea that I would weave the pattern threads in a pointed twill in five different treadlings with plain weave in between. After it was finished, my brother David and I could choose the most effective look. 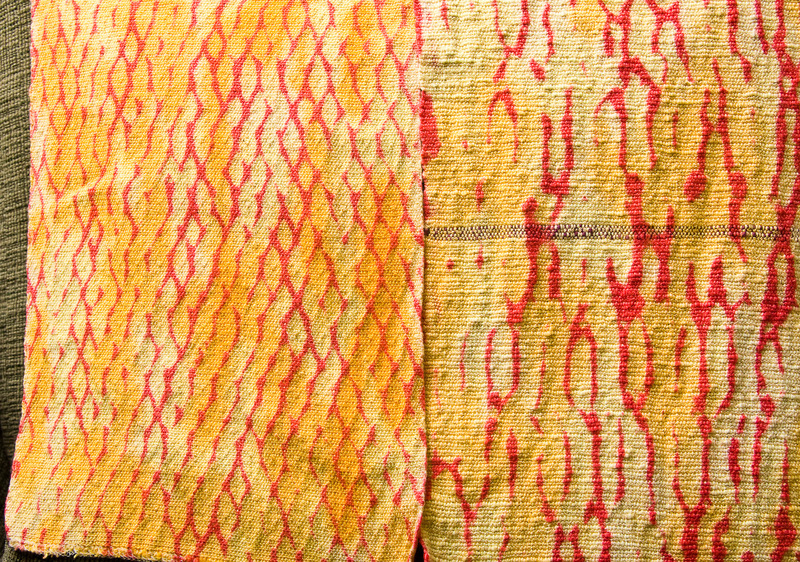 The entire project was based on the colors of Pentecost; the tongues of fire could be dramatic. 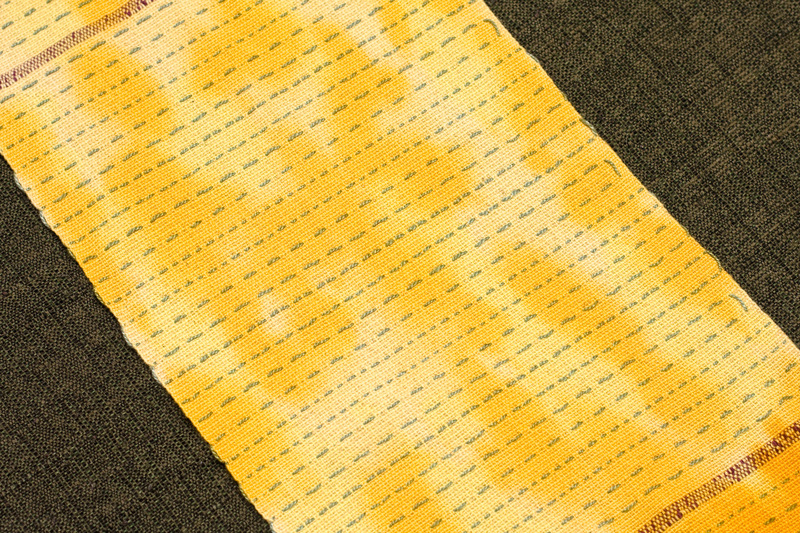 So I wove the cloth and then at dye day I chose two different yellows to dye the open cloth. The purple threads in the cloth separate the different treadling patterns. The small green threads are the pattern threads thrown from a separate shuttle to create the pattern later. 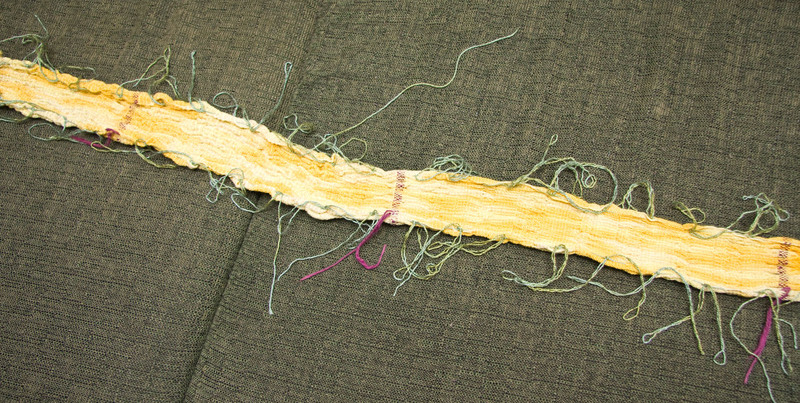 After the dye was set, rinsed and dried, I pulled on the pattern threads to draw the cloth into a tight gather. Then I had to soak the cloth again in a dye activator. 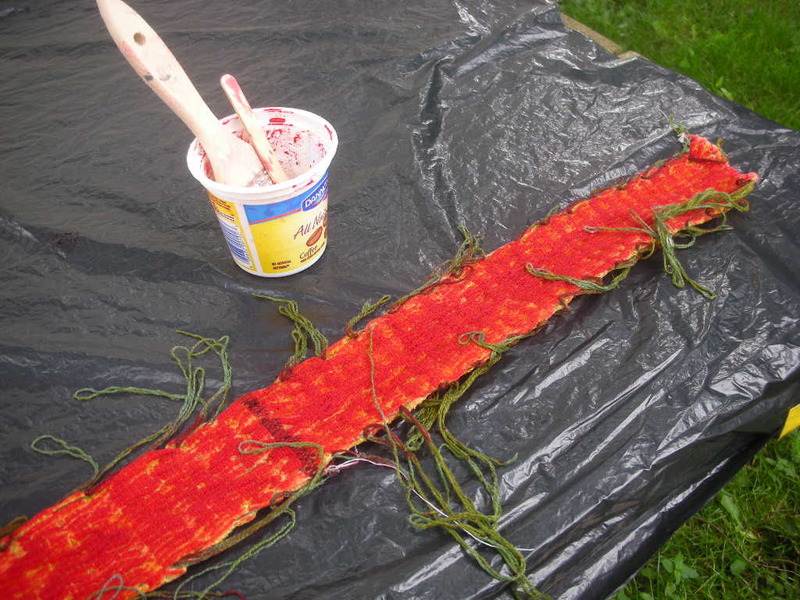 After an hour or so, I took the cloth out to my picnic table where I applied a thickened red dye to the tops of the folds to create a dramatic pattern. Here it is just waiting to be revealed. Shibori is a process that takes patience. After this top dye is applied, it must set for at least four hours, but I wanted to be absolutely sure, so I wrapped it in plastic, had dinner, went to bed, off to work the next morning and then came home to rinse it thoroughly and let it dry outside. Then the threads were cut and pulled out. I was so pleased. 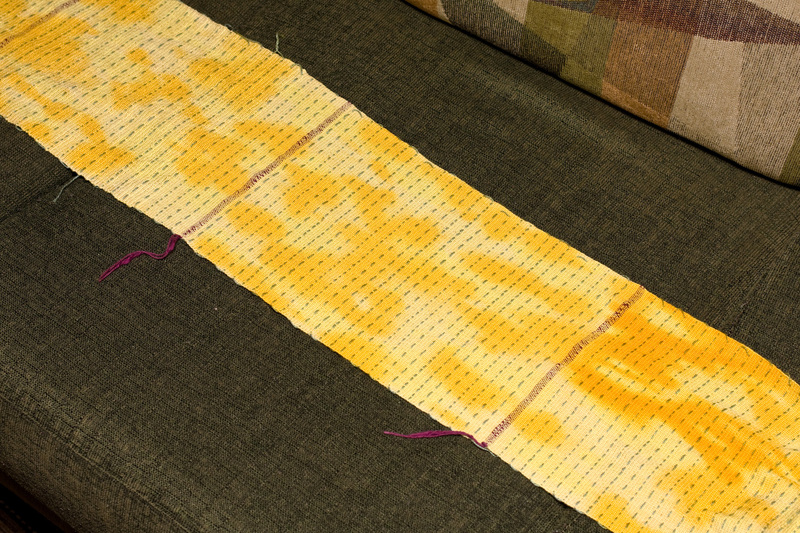 You can see that the treadling changes show an enormous difference in each pattern. Plus the fact that on the right side, I changed my weft from an 8/2 cotton to a flake cotton. Dave chose the pattern on the lower right and I concurred. I think it will made a dramatic presentation of Pentecost and other special liturgical days when he is on the altar. I now know what will occupy my loom for July. I will post the final project when I finish later this summer. Most of my neighbors spent the weekend trying to dig out from the foot of snow that accumulated over Friday and Saturday. Happily, I spent some of that time at the loom finishing my summer and winter towels. Someone in my guild once told me that when you go to the trouble of handweaving an item, you should hand finish it too. Now I love my sewing machine and when the weaving project is yardage for a garment, I obviously turn to my valued mechanical friend. 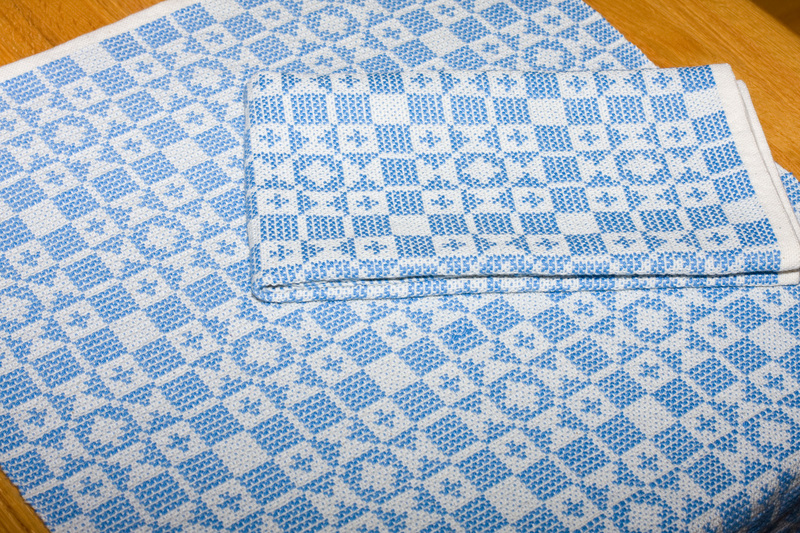 But this project was a set of towels and a machine sewn hem just didn’t appeal. I grabbed the cone of 10/2 cotton warp and threaded a needle to handsew the hems. The thread disappeared and made for a fine finish. 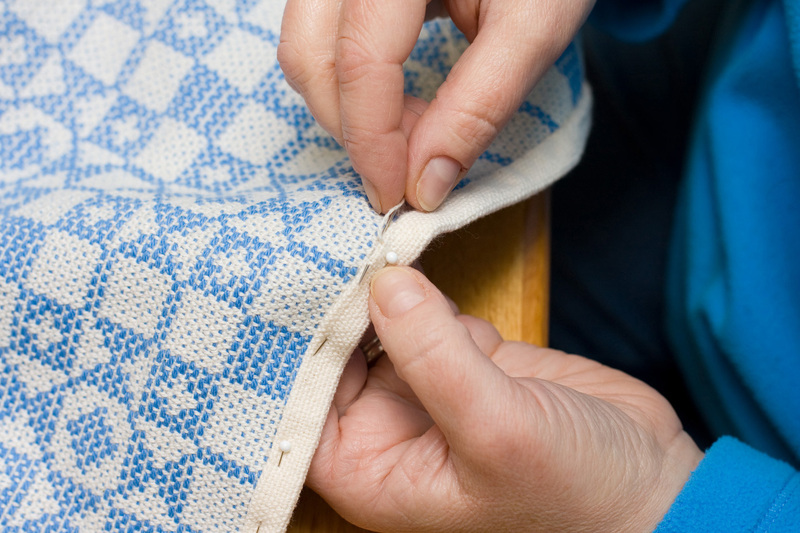 As I held up the towels proudly to show my family, I was shocked to discover two small treadling mistakes I made. Sigh. Some of my other guild friends advise that most people won’t notice unless you point it out. Oh well, weaving always leaves room for improvement.